11 Gorgeous Florida Gulf Coast Beaches - Top Ten Travel Blog | Our experiences traveling throughout the US. Florida’s Gulf coast is home to some of the country’s most amazing beaches. In fact, a number of them have been rated at some time or another as “the best.” While Florida’s Gulf side beaches do not shine in the surfing department due to the calmer more shallow waters, the warm water temps place these beaches higher up on the list for year-round swimming and various other recreational activities like stand up paddleboarding, wind surfing, and kayaking. Additionally, the mild winter weather of the Gulf Coast leads to more attractive year-round sunbathing conditions. And of course, beaches in the Tampa Bay are well-known for their fine, super soft quartz sand & clear water. Dolphin sightings, excellent beachcombing, scenic cruises, & beautiful beachside resorts are just a few more reasons why so many tourists flock to these gorgeous Gulf coast beaches each year. Sand Key is one of the best beaches on the Gulf for beach combing! If you are lucky you may find a coveted sand dollar! While Clearwater is the most well-known and visited of the bunch, plenty of other low-key beaches, including little known gems, offer the same sugary white sand and mesmerizing turquoise waters. There is a beach for every type of beach goer on the Gulf, whether you are looking to relax, collect seashells, take a cruise, bird watch, hike, play volleyball, take in a gorgeous sunset, or watch for dolphins & manatee early in the mornings. Below are a handful of the most amazing Florida Gulf beaches to add to your bucket list! 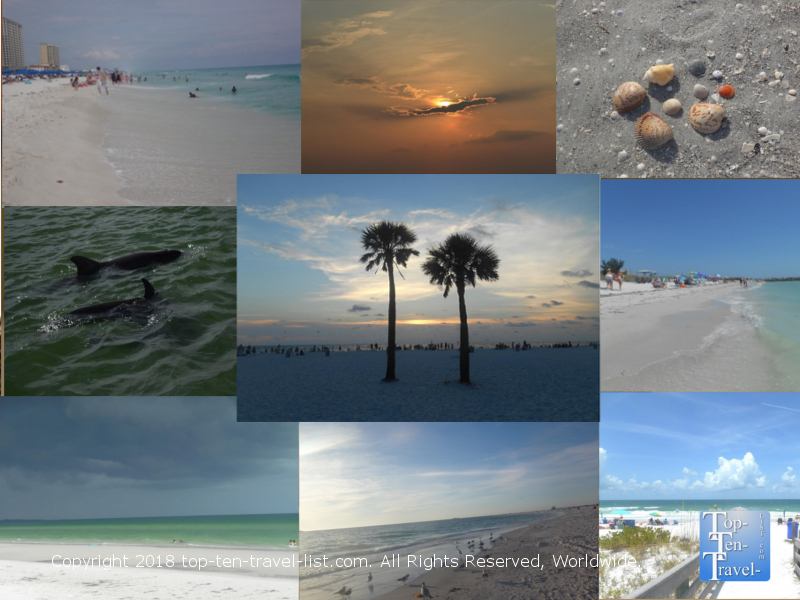 Just south of Sarasota likes Siesta Key, an 8 mile long barrier island known for its’ incredible beaches. Siesta Key Beach, with its’ very wide stretch of 99% pure quartz sand, is easily one of Florida’s most picture-perfect beaches. Digging your toes into the soft, powdery smooth sand, listening to the gentle waves, all while enjoying a lazy afternoon sunbathing or reading a book – this is the picture perfect Florida beach day you have been dreaming about. 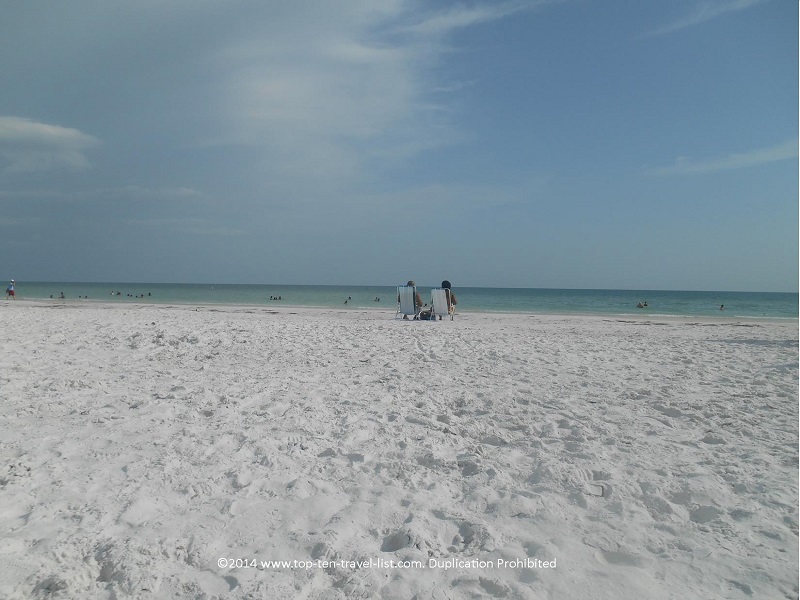 In 1987, at the Great International White Sand Beach Festival,” Siesta was rated as being home to the “whitest and finest sand in the world.” The sugar white sand contrasts gorgeously amongst the the bright blue color of the water. When a summer thunderstorm rolls in, the views become even more amazing as the water turns a brilliant shade of turquoise. 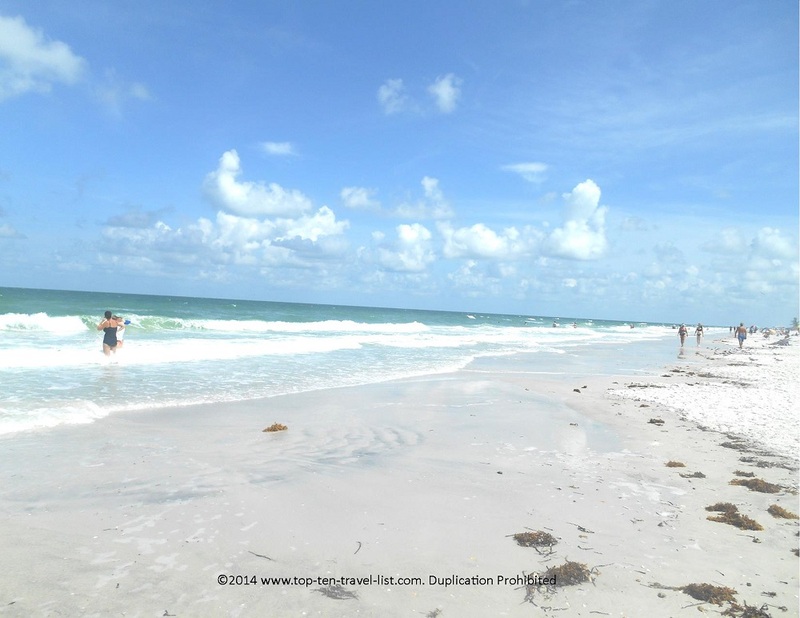 Siesta is the perfect Gulf coast beach choice for those looking to relax. The sand here seems to stretch on forever, especially in comparison to many of the more narrow Gulf beaches. There’s plenty of room to stretch out and enjoy a peaceful afternoon soaking in the Florida sunshine. And if you prefer fitness to relaxation, Siesta is one of the few beaches offering volleyball nets. In fact, several high profile volleyball tournaments are held here each year. What else to do nearby: Before/after your trip to the beach, you can stroll over to Siesta Key Village. This laid-back, touristy entertainment destination is lined with numerous restaurants and shops including a great little beachy themed coffee shop called Lelu’s Coffee Lounge. Madeira Beach is one of the best-of-the-best for tourists as you will find so much more here than simply beautiful white sand beaches. At the adjacent St. John’s Boardwalk, you can enjoy fun touristy activities like dolphin watching, cruises, themed restaurants, tiki bars, and festivals throughout the year. The vibe is fun and vacationy, and thus, perfect for anyone looking more for an upbeat, active beach experience. Sightings are guaranteed on the dolphin cruises, although you are more than likely to see dozens. Madeira’s 2.5 mile long shoreline consists of gorgeous smooth white sand beaches, with beautiful crystal clear water and tons of seashells. Cabana rentals are a great way to enjoy a long relaxing afternoon without the sun blaring down on you. What else to do nearby: At Hubbards Marina, you can sign up for a snorkeling tour, sunset cruise, or deep sea fishing tour. A 3 hour shelling cruise to Egmont & Shell Key is the perfect trip for avid beach combers. Wave runners, paddleboat and kayak rentals are just more options for fun-in-the-sun. 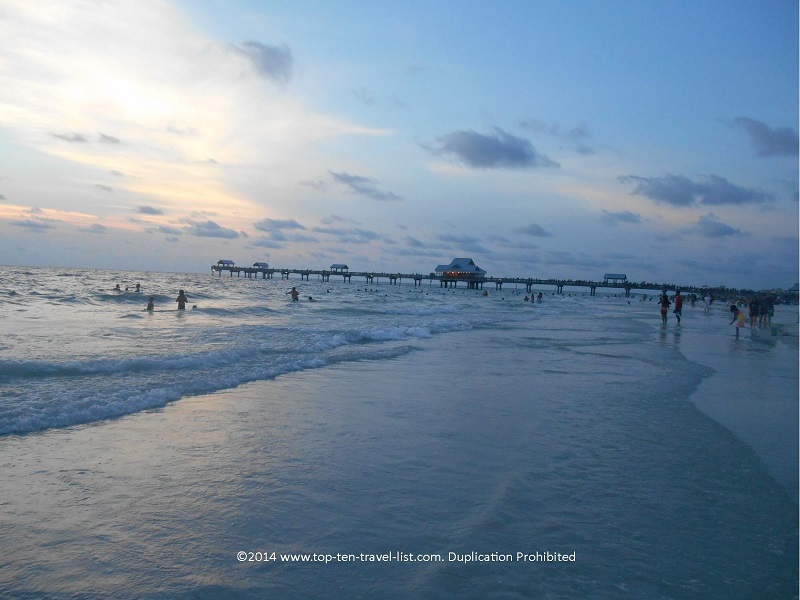 Clearwater is easily one of the most recognizable beaches in all of Florida. Time and time again, Clearwater shows up on numerous “best of” beach lists. Both Tampa and Orlando tourists flock here to dig their toes in the fine powdery white sand and swim in the namesake clear water. The sand here is so soft to the touch that it really resembles snow more so than sand. Unfortunately, this beach can get really crowded and finding parking can be a real hassle, so plan a weekday to avoid the crowds and unnecessary frustration. The historic pier, the beautiful sunsets, the smooth sand and clear water, the boat tours, the fun events (such as Pier 60 festival movies on the beach) – this beach has so much going for it. The shallow, super clear water makes Clearwater a favorite for swimming. Dolphin watching tours, pirate themed cruises, parasailing, and kayaking/stand up paddlebarding are more options -literally you can easily spend the entire day here without getting the slightest bit bored. There is a gorgeous palm tree lined walking area, although it is hideously overcrowded on the weekends. Be sure to take advantage of one of the cruises – (especially the sunset) or Captain Memo’s fun themed pirate cruise (it’s a blast!). What else to do nearby: If an afternoon of quiet shelling sounds more like your thing, head over to nearby Sand Key Park (located just over the bridge) for more shells than you could ever imagine. 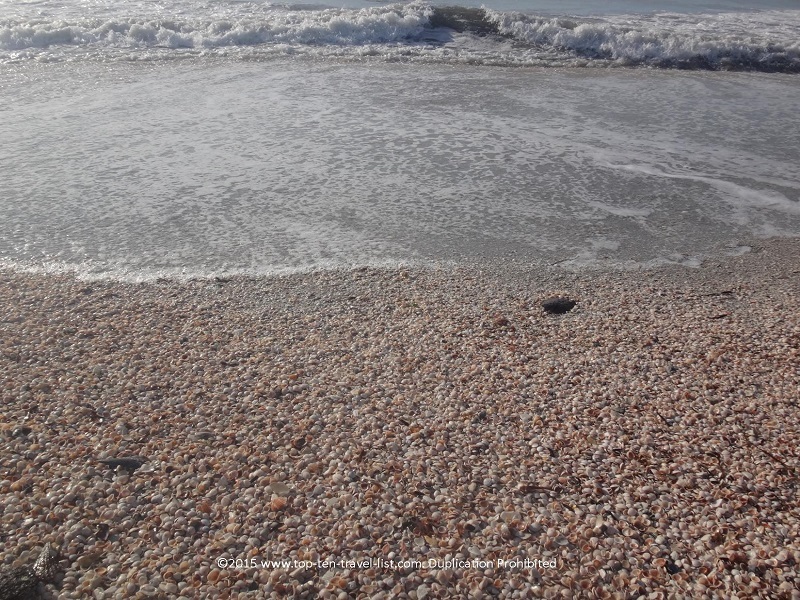 This beach is loaded to the brim with seashells – definitely one of your best bets in Florida for amazing beachcombing. If you have extra time, be sure to check out Winter the Dolphin (from A Dolphin Tale) at the acclaimed Clearwater Marine Aquarium. Honeymoon Island, a barrier island across from St. Joseph’s Sound, is the most visited state park in Florida. With a gorgeous 4 mile mile stretch of white sandy beaches, several miles of fantastic hiking trails through rare habitat, excellent beach combing opportunities, a great dog beach, and amazing sunsets, Honeymoon Island really has it all. This is the perfect place for a full day of fun in the Florida sun. 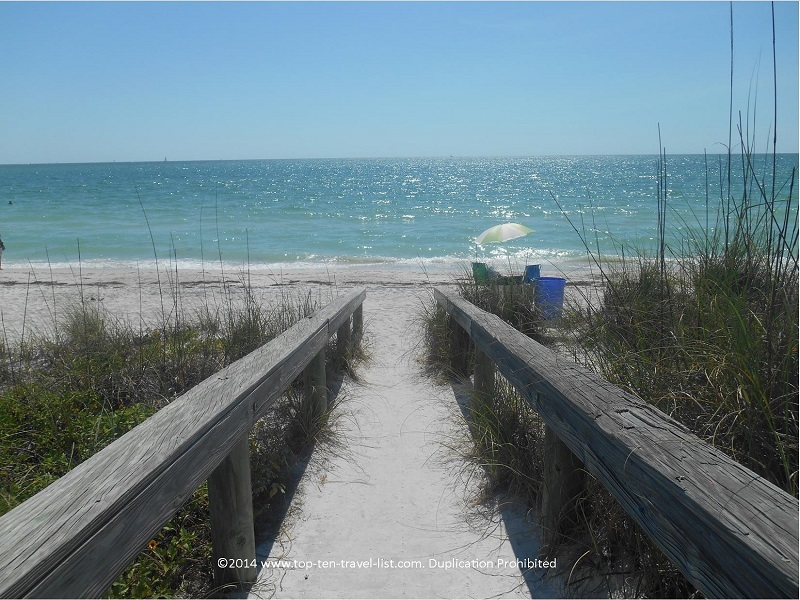 Honeymoon Island State Park is located near Dunedin, a charming community about 30 minutes west of Tampa. While the beaches are amazing, the highlight of visiting Honeymoon Island is the wonderful network of hiking trails. The easy 2.5 mile Osprey trail takes you through a super rare Florida virgin slash pine forest, one of the few remaining in the state. Bald eagles are commonly sighted, as well as gopher tortoises and armadillos. Asides from all the wonderful amenities at the state park, you also have the option of hopping on the 20 min ferry ride to Cadalesi Island, frequently rated one of the most beautiful beaches in the country. This beach is super secluded, giving you the feeling of being stranded on a remote island. It’s also an excellent place for snorkeling and beachcombing. What else to do nearby: Be sure to check out downtown Dunedin, a charming Main Street loaded with unique restaurants and shops. Cafe Alfresco and The Living Room on Main are 2 excellent lunch choices. There is a beautiful bike path which runs through the center of downtown called the Pinellas Trail. This path stretches on for 40+ miles through numerous Gulf coast towns, and is easily one of the best rail trails in the country. Anna Maria Island is a low-key beachside community about an hour south of Tampa. This island is most popular with northern snowbirds during Florida’s mild winter season, however, the charming town remains quite peaceful during the off-season, and thus, is the perfect beach choice for those looking to relax and enjoy the natural beauty of the Florida coast in the absence of noisy tourists. Unlike the more touristy Gulf beaches, Anna Maria Island maintains an old-fashioned charm with little in the way of any beach side commercialization. As you drive in, you will notice rows of colorful cottages lining the streets – it’s like a step back in time to Old Florida. 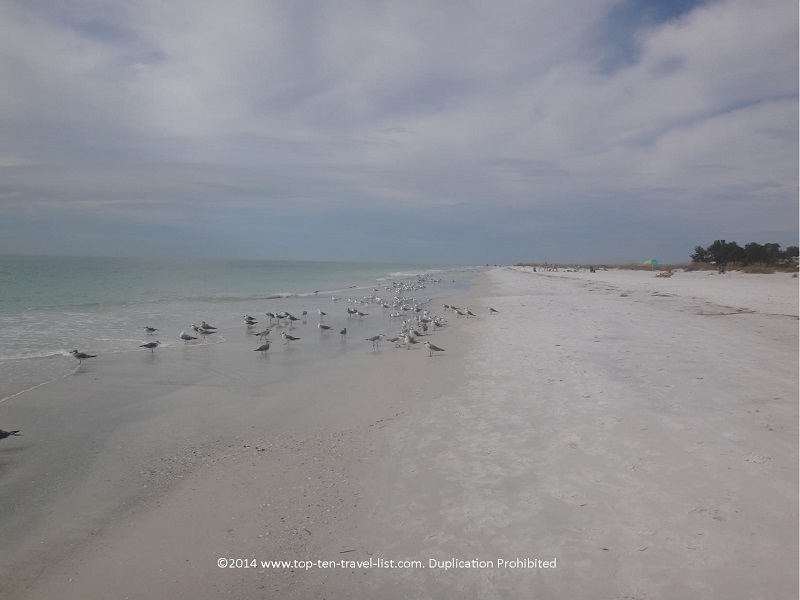 The 7 mile stretch of quaint white sand beaches of Anna Maria Island is the perfect place to escape the rowdy tourists for a day of sunbathing, swimming, reading, beachcombing, or birdwatching. Beachcombers will be pleasantly surprised as the beaches here offer no shortage of diverse shells. Birdwatching is a real treat here as many diverse species can be seen here, especially during migration season as they make their way to this barrier island, enroute from the arctic to South America. Egrets, osprey, pelicans, herons, and sandpipers are just a handful of species you will likely see. What else to do nearby: Just 10 miles away lies the incredible Robinson Nature Preserve, a gorgeous hiking & biking destination which also offers exciting birdwatching opportunities. Pensacola Beach, located on the Gulf coast barrier island of Santa Rosa, features some of the smoothest sand of all. Comprised almost entirely of quartz, you will be tossing off your flip flops and digging your feet right into the fine sugar like sand, which rivals the smoothness found at Sarasota’s Siesta Key. This beach is most know for its’ stunning pier, which at 1470 feet, is one of the largest on the Gulf of Mexico. 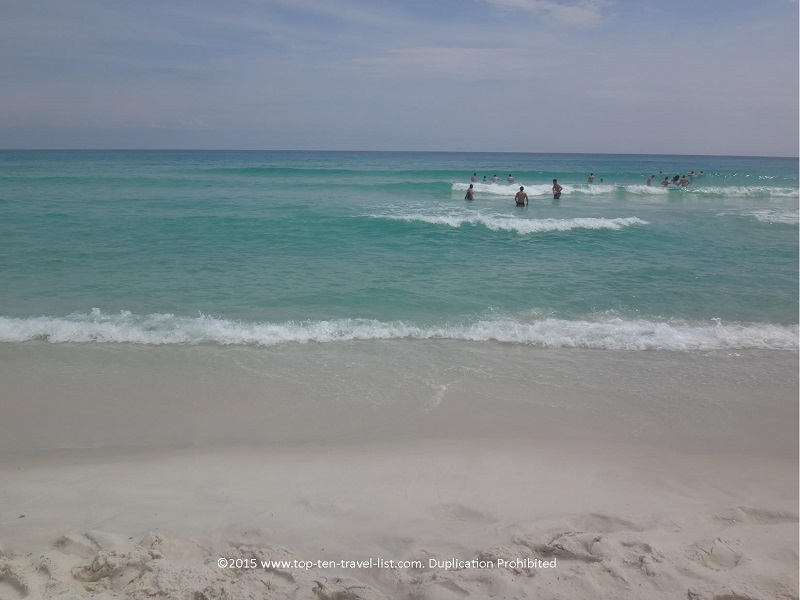 The Emerald Coast is the nickname given to the 100 mile stretch of beaches in the Panhandle region. The name comes from the brilliant emerald green hue of the water which results from the sun reflecting off the algae. Like most Florida Gulf beaches, Pensacola offers no shortage of bird watching opportunities. Orioles, towhees, indigo buntings, warblers, and osprey can all be seen as hundreds of migrating birds make their way to the Gulf Islands National seashore, the longest section of protected seashore in the country. Three species of the endangered sea turtle can be found here. The nesting season for the sea turtle runs from May-October, with the prime hatching season in August. Consider yourself lucky if you get to see one of these magnificent creatures. The adjacent beach boardwalk is home to a number of restaurants and bars. Hemingway’s is a casual grill which overlooks the Santa Rosa Sound. The Grand Marlin is another excellent choice, especially if you like seafood. What else to do nearby: If you have a bit of extra time, I recommend strolling around charming downtown Penscaola. Check out Fosko Coffee Barre and V. Paul’s Italian Ristorante. 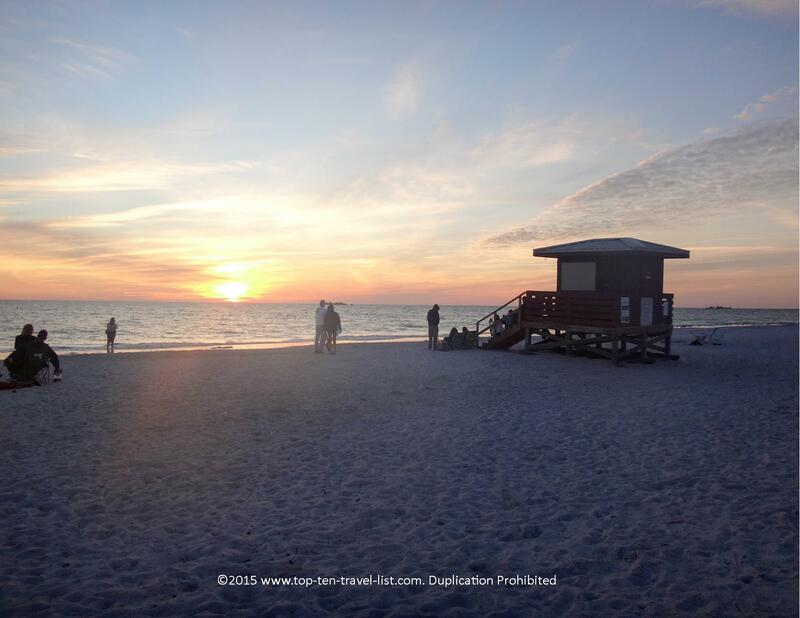 Lido Beach, another beauty in the Sarasota region, is a picture-perfect sunset destination. While the sand here is not quite as smooth as Siesta Key, there are tons of seashells to be found. Dolphins are frequently sighted, so much so that most tours guarantee sightings. You may even be lucky enough to find a prehistoric shark tooth, however, that is much more likely at Casperan: the shark tooth capital. Lido is a great place to relax and take in some gorgeous Gulf Coast scenery. 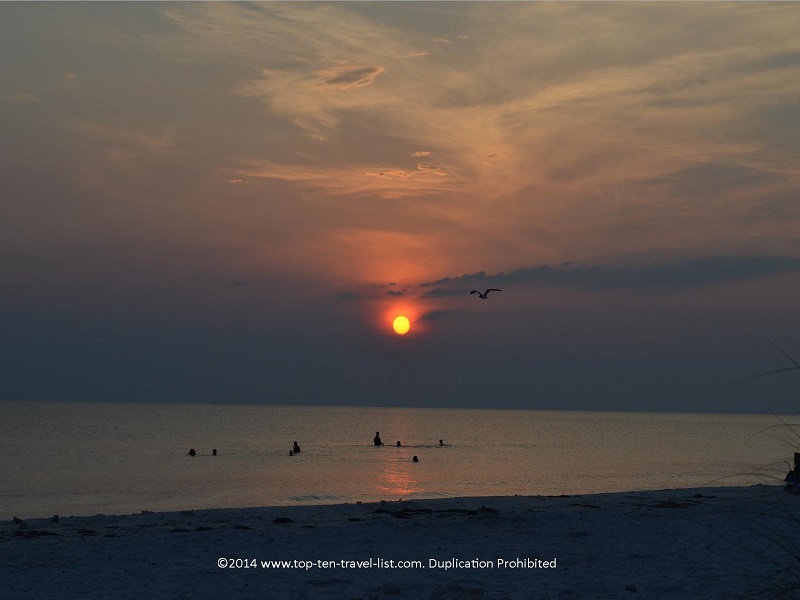 More laid-back and much quieter than Siesta, it’s a perfect non touristy alternative, especially for those wanting to enjoy a magnificent Florida sunset. Or better yet, treat yourself to a gorgeous sunset cruise. What else to do nearby: As an added bonus, this beach is nearby St. Armand’s Circle, an upscale dining and shopping destination which is home to Columbia, the largest Spanish restaurant in the world. Be sure to try the amazing Cuban Black Beans dish! Sarasota Jungle Gardens, featuring free roaming flamingos and exotic birds, is worthy of a look if you have the extra time. Fort de Soto Park, located just southwest of St. Petersburg, is a 1136 acre park located on 5 “keys” or islands: Madelaine Key, St. Jean Key, St. Christopher Key, Bonne Fortune Key & the main island, Mullet Key. The habitat of these keys is very diverse, consisting of mangroves, hardwoods, palm hammocks, wetlands, and beaches. Spring and fall are the best seasons to see migrating birds, of which 328 species have been identified. Herons and white ibis are most frequently sighted. 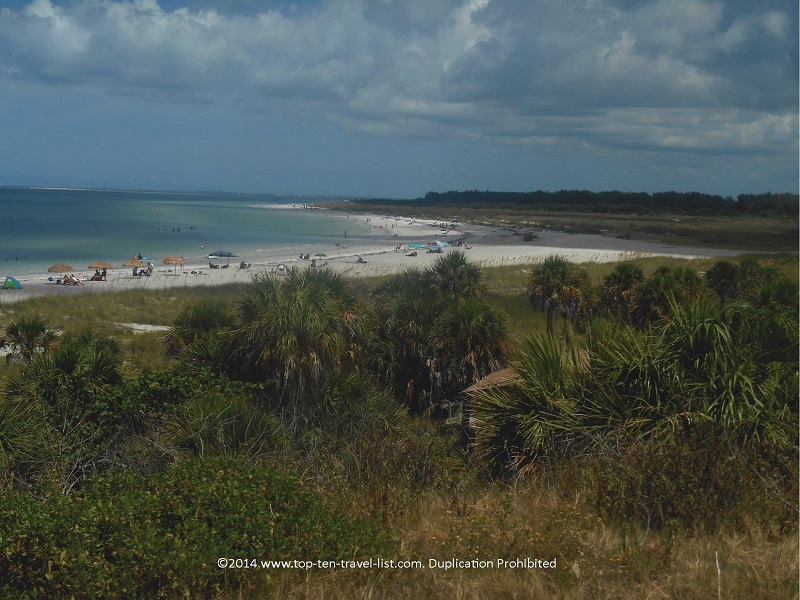 Fort de Soto is one of those rare parks which offers it all, conveniently in the same place. Smooth sugar sand beaches, hiking trails, a gorgeous 7 mile bike path, a 2 mile long canoe trail, 2 fishing piers (5000 and 1000 feet long) and a scenic observation deck are just a few of the great amenities found here. This is a great place for basically any type of recreation – swimming, sunbathing, biking, walking, fishing, kayaking…you name it. You also have the option of taking a ferry over to Shell Beach (great beachcombing) or Egmont Key (home to a historic lighthouse and also a great place for snorkeling). Look into the weekend tour offered by Fort de Soto Eco tours. This 90 minute boat ride takes you past the estuaries and inshore areas of Mullet Key, giving you an upclose look at the mangrove shorelines. Lots of manatee and dolphin sightings are just extra bonuses. What else to do nearby: Nature lovers must check out Boyd Hill Nature Preserve. This is one of the best places to see alligators in their natural habitat within the Tampa metro area. We even had the rare opportunity to see baby alligators here. Numerous hiking trails are available, as well as a narrated tram preserve tour. 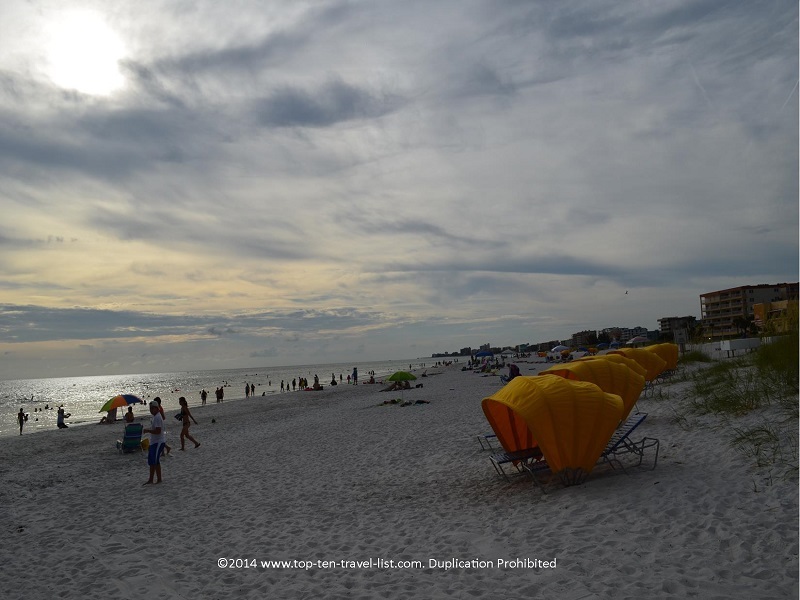 Casperan Beach, located in beautiful Venice, is nicknamed “the shark tooth capital of the world.” You will notice that the beach takes on a very different tone and look than most other Gulf coast beaches. It’s very rocky, and thus, a great place for beachcombing and shark tooth collecting. Instead of sunbathing & swimming, you will find the locals and tourists out with their shovels attempting to capture a rare prehistoric shark tooth. These shovels can be found at pretty much any local store or ordered online in advance. While you will not get to enjoy the soft, smooth sand that the Gulf is so famous for, you will enjoy incredible views. And, you might just leave with the best souvenir of all – a piece of history millions of years old in the making. What else to do nearby: Venice area Audubon Society is a great choice for birdwatchers and another hotspot for alligator sightings. Big Cat Habitat in nearby Sarasota is an excellent sanctuary dedicated to providing a natural habitat for rescued animals. Whether you feel like lazying around digging your toes in the fine white sand, taking a ferry ride over to Shell Beach, enjoying a laid-back dolphin cruise, browsing the shops in the historic district, or testing your balance on a stand up paddleboard, there’s plenty to do here. Additionally, there is a great little walkable historic district known as 8th Avenue, featuring all sorts of eclectic restaurants and shops. What else to do nearby: Weedon Island Preserve is an amazing place to hike. The trails are gorgeous and diverse, and the opportunities for birdwatching and wildlife sightings (armadillos and tortoises are a common sight) are endless. 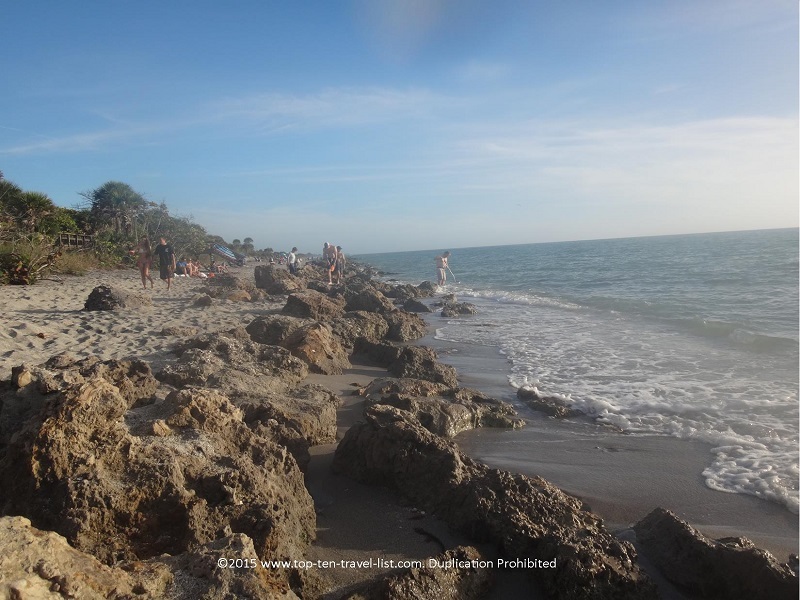 Indian Rocks is located within the Tampa metro area and is a favorite amongst locals and anyone else seeking a charming, old school beach atmosphere. Indian Rocks offers 3 miles of beautiful fine sand beaches with clear water. This beach is especially quaint as houses line the beach as opposed to big businesses. It retains that charming old-fashioned vibe which is lacking in most touristy over developed beaches today. While the sand isn’t as smooth as most others on this list, the beachcombing is amongst the best on the Gulf. If you are lucky you may find a coveted sand dollar. And the waves here are pretty big for a Gulf Coast beach, meaning fun boogie boarding, wind surfing, and swimming conditions. What else to do nearby: Before your afternoon out at the beach, I highly recommend treating yourself to a coffee at the wonderful Indian Shores Coffee Company. You will also want to check out the wonderful (and free!) Florida Botanical Gardens, located just a few miles away in Largo. *Don’t forget to pack all the essentials – beach towels, sunblock, sunglasses, a beach chair and umbrella (a must to block the sun), change for the parking meters (some beaches charge, others have free lots), plenty of water bottles and snacks. *Applying leave in conditioner to your hair prior to your beach day can help prevent some nasty snarls later in the day. If you color your hair, spray it with a color protector to avoid UV damage. *A rolling beach cart comes in handy for those with a large haul. *Invest a comfortable beach lounger chair if you plan to lay out. It’s not very comfortable to lay directly on a towel on the hard sand! *Check the weather forecast and be prepared for random afternoon thunderstorms even if the forecast shows no rain. Gulf summer weather can be very unpredictable. *Bring with your own picnic lunch. Many of the beaches have beautiful picnic areas so you can enjoy the scenery and save yourself a few bucks. Others have great parks nearby so you can extend your day further with another great activity. *Low tide after a strong storm is the best time for finding seashells. If your shorts have no pockets, consider bringing a ziploc or small container to hold your treasures. *Be aware of Florida shelling laws. For instance, it’s illegal to collect a live sand dollar. *Don’t leave any valuables on the beach especially if you plan on going in/out of the water! A waterproof pouch for necessities is a good idea, but it’s always best to limit what you bring to that absolutely necessary. *Wash off all sand at the rinse station and bring extra towels to dry off to prevent tracking sand in your car – it’s a complete hassle to get out once it’s there! You can also bring an extra large garbage bag or several recyclable grocery store bags to throw in your beach bags, swimsuits, and any other sandy stuff etc to avoid dragging sand in the car. Line your car with a plastic bag too. Change into fresh clothes and gym shoes (the flip flops seem to keep collecting sand and it is impossible to remove the sands from your toes once it accumulates) and throw all your sandy clothes into a mesh bag and throw this inside the larger garbage bag. *Arrive early, if possible. It will be less crowded, easier to find parking, and the sun will not be as intense! 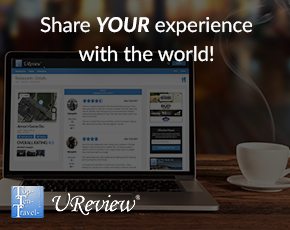 *Visit during the off season to avoid crowds and score cheaper hotel deals. 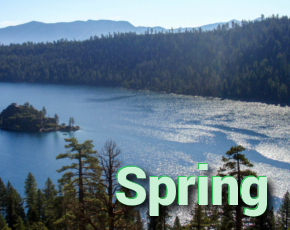 *Bring bug spray if you plan on hiking any trails – you will be glad that you did! 27 Ways to Make it Feel More Like Fall in Hot, Humid Florida!